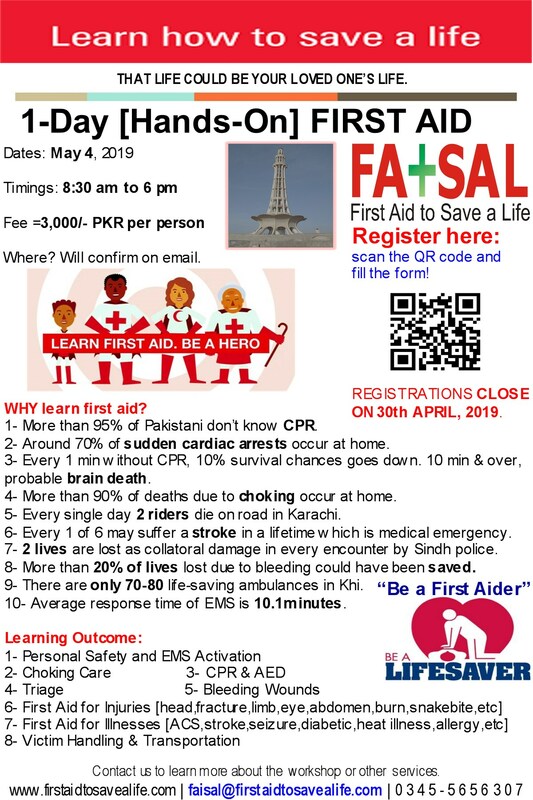 First Aid to Save a Life (FATSAL) Pakistan is pleased to announce an internationally acceptable and accredited one day training program, “First Aid, CPR and AED” on 22nd December at Hotel Sunfort, Liberty, Lahore. This is a registered training course. This training program is designed specifically for the occupational first aid provider and fulfills industry requirements. The course is based on the guidelines for CPR and First Aid, released in 2010. This course will help students to gain the knowledge skills, and confidence necessary to manage a medical emergency using CPR and first aid until more advanced help is available. Also, participants will get real life experience to use Automated External Defibrillator (AED). This training familiarizes the candidates with the latest concepts in emergency/workplace first aid according to latest guidelines released by 19 resuscitation councils of the world. 1:- 2-professional adult CPR-AED training manikins (with CPR monitor) for realistic experiences and feedback. 3:- AED device for training purpose. 4:- First aid supplies for pure training purposes. 5:- First Aid Box will be available for filling and re-filling exercises. 01:- Certification: Successful participants will receive (individual) successful accredited certificate with 2-years validity card. 02:- Training Booklet: Full-color Student Guide Book from approved course contents. 03:- Wallet Skill Card: A personal wallet skill guide card which can be used for quick reference/revision. 04:- Award-winning, professionally produced videos. 05:- A proven “seeing, hearing, doing, speaking, feeling” approach to learning. 06:- Low-stress training with user-friendly materials and positive coaching. 07:- Significant classroom time for hands-on practice. You are kindly requested to disseminate this training course to your respective organizations and colleagues so that they can positively participate in the said training program and acquire the benefits. We look forward to your valuable cooperation and support. This entry was posted in 1-Day Training Programs, Advanced First Aid, Basic First Aid, FATSAL Announcements, FATSAL Training Offers, First Aid and CPR, First Aid CPR and AED, First Aid Training Programs and tagged accredited, Accredited first aid training companies, Accredited first aid training courses, Accredited first aid training courses in Asia, Accredited first aid training courses in Pakistan, accredited training programs, accredited trainings, AED, aed training, AHA approved first aid training courses, AHA approved training courses, automated external defibrillator, automated internal defibrillator, best hotels of hyderabad, companies from lahore, cost of training and sustainability, CPR, CPR and AED Workshops in Gujranwala, CPR and AED Workshops in Hyderabad, CPR and AED Workshops in Islamabad, CPR and AED Workshops in Islamabd, CPR and AED Workshops in Karachi, CPR and AED Workshops in Lahore, CPR and AED Workshops in Multan, CPR and AED Workshops in Pakistan, CPR and AED Workshops in Peshawar, CPR and AED Workshops in Sukkur, cpr and first aid training, cpr training, ehs trainings, events planned in lahore, fatsal pakistan training program, first aid, first aid and fire safety training courses in hyderabad, first aid and fire safety training courses in islamabad, first aid and fire safety training courses in karachi, first aid and fire safety training courses in lahore, first aid and fire safety training courses in multan, first aid and fire safety training courses in pakistan, first aid and fire safety training courses in peshawar, first aid audit of location, first aid for all, first aid for medical problems, first aid training, first aid training courses in hyderabad, First aid training courses in islamabad, first aid training courses in islambad, first aid training courses in karachi, first aid training courses in lahore, first aid training material, free training, free training courses, hse companies in peshawar, HSE courses in 2012, hse courses in hyderabad, HSE courses in pakistan, HSE services and training providers, HSE training courses in Hyderabad, HSE training courses in Hyderabad Pakistan, hse training courses in islamabad, hse training courses in karachi, hse training courses in lahore, HSE Training courses in pakistan, hse training courses in peshawar, injuries and first aid, khybar pakhtun khawa, KPK, Lahore, latest first aid training material, latest first aid training modules, medic first aid international, medic first aid office in asia, medic first aid office in india, medic first aid office in islamabad, medic first aid office in jhelum, medic first aid office in lahore, medic first aid office in pakistan, medic first aid office in punjab, medical problems and first aid, occupational safety training institute pakistan, peshawar, peshawar kpk, registered training courses, registered training program, road traffic accidents and first aid, safety courses in hyderabad, safety training companies, safety training company, safety training institues from lahore, safety trainings, scene safety, specific first aid topics, sustainable business solutions, sustainable training solutions and first aid to save a life pakistan, training and consultancy companies from lahore, training companies from lahore, training courses, training courses in hyderabad, trainings, trainings and return on investment, trainings and ROI, trainings at no cost, trainings in peshawar, trauma and first aid, upcoming aed trainings, upcoming cpr trainings, upcoming first aid training courses, upcoming first aid trainings, upcoming trainings, what is new. Bookmark the permalink.